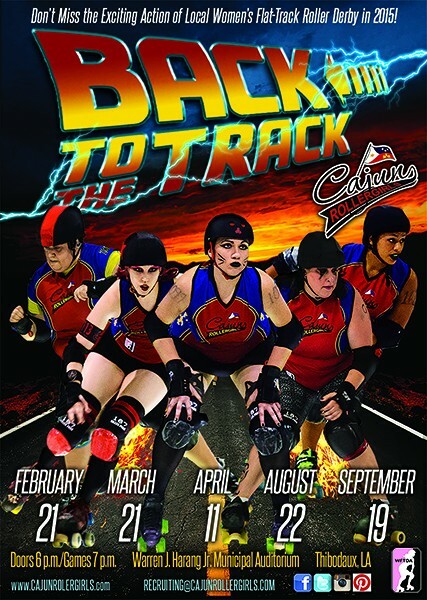 The Cajun Rollergirls women’s flat-track roller derby league will host five home games as part of their 2015 regular season schedule, released today. All home games will begin at 6 p.m. and will take place at the Warren J. Harang Jr. Municipal Auditorium, 310 North Canal Blvd., Thibodaux. Ticket on-sale dates will be announced prior to each game. 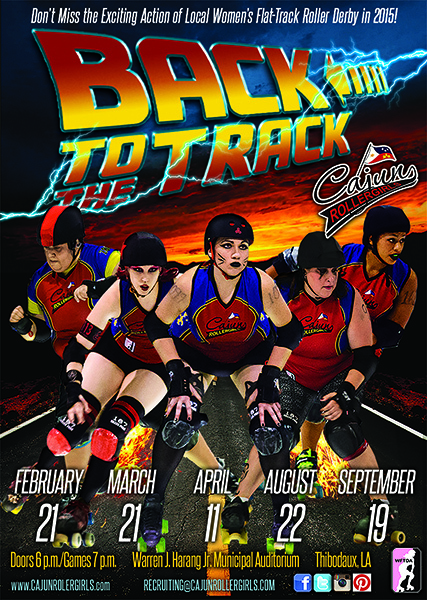 The 2015 schedule opens with a three-game home stand, as we take on the New Orleans Brass men’s roller derby league on Saturday, Feb. 21, a first-of-its-kind event for the Tri-Parish area. Home contests follow against the Acadiana Roller Girls on March 21 and the Pensacola Roller Gurlz on April 11. The team then travels for four consecutive games, facing the Big Easy Rollergirls’ Crescent Wenches in New Orleans on April 25, the CenLa Derby Dames on May 30 in Monroe, the Red Stick Roller Girls in Baton Rouge on June 20 and the Mississippi Rollergirls on July 25 on the Mississippi gulf coast. The season closes with home games against the Spindletop Rollergirls on Aug. 22 and against the Gulf Coast Roller Girls’ Lafitte’s Ladies on September 19. For more information on the Cajun Rollergirls’ 2015 season, visit www.cajunrollergirls.com and follow the Cajun Rollergirls on Facebook, Twitter, Instagram and Pinterest!